It was pretty easy in Mark Richt's last couple of years in Georgia to question whether he had lost his edge. His swagger was gone, and the only thing he was consistently great at was underachieving expectations. Well, all he needed was a change of scenery, I guess. He's only in his second year at his alma mater, and he has this team heading straight to a playoff berth. The team was fairly hard to completely buy into despite all the wins. But then they dismantled Notre Dame as completely and emphatically as any serious contender has been dismantled all year, and Miami was elevated into the highest levels of respect. But now they find themselves in a potentially tricky situation. They are looking ahead to a date in the ACC Championship Game with Clemson. They have already claimed their berth, and so has Clemson. Miami needs to keep winning to keep playoff hopes alive, but they could easily convince themselves that they have already accomplished a significant goal. Virginia and Pitt, Miami's last two opponents, are clearly inferior, but they have nothing to lose. We'll learn a lot about how tough and hungry the Hurricanes really are here. If they are ready they will win handily. But if they have spent more time believing their own hype and reading headlines than preparing for this game then they could be in trouble. Miami is absolutely stellar at taking the ball from their opponents. They are +15 on the season, and they have been even only once and have never lost the turnover battle. Virginia absolutely has to protect the ball if they want to have any chance of winning here. Virginia QB Kurt Benkert has thrown a pick in each of his last four games, but he is a quietly solid passer. He won't overwhelm, and he can't be called explosive, but he can quietly move the ball. He's the most important player on the field for Virginia. The truth is that Miami isn't particularly strong offensively - they have succeeded this year despite an offense that isn't elite. If Benkert can protect the ball, and keep it away from Miami for well over half the game, then the Hurricanes might struggle to cover this spread. On the other hand, Miami had no issues at all against Notre Dame despite their general offensive shortcomings, and this Virginia team doesn't even begin to measure up on paper against Notre Dame. Virginia safety Quin Blanding is one of those guys who seems like they have been in college for about 20 years. He's the best player on the defense in my eyes, and will be leading the team on what is likely a pretty specific path - to stop the run so that the Hurricanes are forced to rely on the arm of Malik Rosier. 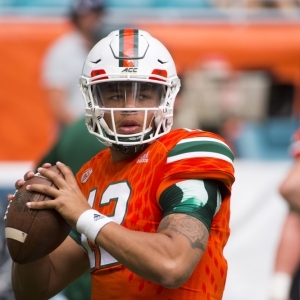 Rosier is far from a bad quarterback, but he completes less than 57 percent of his passes and is unreliable on longer passes in particular. Just as Virginia needs to keep the ball away from Miami, they also need to turn this into a passing contest. There is a road map for Virginia to make this interesting. It just remains to be seen if they are up to following that map. The game opened with Miami favored by 19.5 and has fallen only slightly to 19 in most spots . A slight majority of bets have been on the Cavaliers, so we aren't likely to see significant movement. The total opened at 50.5 and has been stable in early betting action. The Cavaliers are 2-5 ATS in their last seven road games, 1-5 ATS in their last six games in November, and 3-7 ATS in their last 10 conference games. However, they are 4-1 ATS in their last five against teams with winning records. Miami is 8-0 ATS in their last eight November games, 6-2 ATS in their last eight against teams with winning records, and 10-4 ATS in their last 14 games overall. I like Miami and am certain that college football is better when the Hurricanes are relevant. They should win this game comfortably, and they have a good chance of beating Clemson and heading to the playoff - which would cap the best coaching year of Richt's strong career. But given that Virginia is a respectable, bowl-eligible team with nothing to lose, that Miami isn't likely to be at their sharpest following that Notre Dame win, and that I don't entirely trust the Miami offense, I can't justify betting on Miami here. Nineteen points is too much to comfortably give up, so Virginia has to be the play - a lukewarm play perhaps, but the play.